The trail surface is mostly compacted dirt and gravel, typically in good shape. Getting there: From Central Austin on I-35, take the Oltorf Street exit and head west on St. Edwards Drive. Look for the preserve on the right side soon after a bend in the road after St. Edwards Circle. 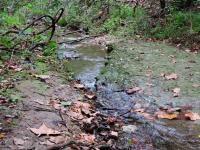 The Hike: Just blocks away from nearby Blunn Creek Greenbelt, Blunn Creek Preserve feels like another world altogether. 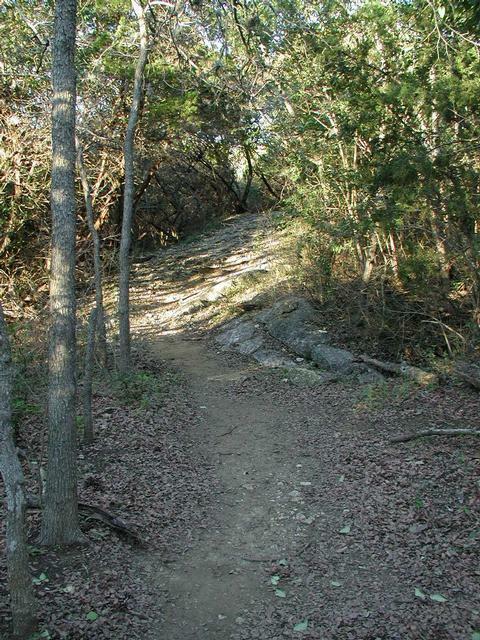 The park is larger, more rugged, less visited and offers a bit more of a true hiking experience, all the while still surrounded by South Austin. We began our hike at the western preserve entrance marked by the waypoint "Trailhead". Please note that the start of our hike turned out to not be the official entry point to the preserve. 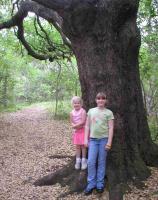 When visiting, please enter the preserve from the south, along St. Edwards Drive. There are much better parking options at the south entrance. If you've hiked the nearby greenbelt, the first thing that you'll notice is that this is no city park. 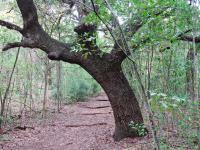 It's run as a nature preserve and so remains largely wild and rough. 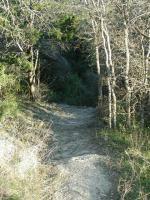 The trails, though well maintained, are rocky and occasionally steep. One moment you'll find yourself enveloped in dense tree cover and the next you're looking out to sweeping vistas of the preserve and surrounding city from atop a hill. 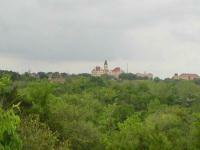 Several overlooks provide views of downtown and other parts of the city. We started to the left and headed north in the direction of the waypoint "Overlook", near the eastern edge of the preserve. 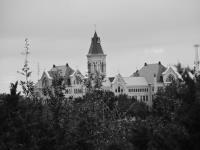 This first overlook is the more impressive to be found along the trail and look upon St. Edwards University, also on a hilltop in the area. 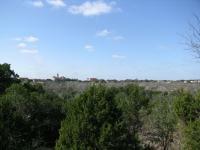 Another overlook a short distance to the north provides views into parts of downtown Austin. Though hilly in places the trail tends to be well maintained. At points on the trail a close examination of the trail surface will uncover something a bit odd about the gravel's texture. The odd mixture is actually compressed volcanic ash, the by-product of eruptions from Travis County's very own volcanoes that existed here approximately 75 million years ago. Some of the tops of those volcanoes now provide birds' eye views of the surrounding terrain. In the more recent past, part of the land that makes up Blunn Creek Preserve used to be a dairy farm in the 40's and 50's. The city acquired the land and set it aside as a preserve, but not before significant damage had been done to native flora and fauna that live here. On our trip we just happened to run into Rene Barrera from the City of Austin's Parks and Recreation Department. We'd met Rene before and on this occasion we touched on some of the changes that this land has witnessed in the last 100 years. Foreign, introduced plants are choking out the natives that many of the local animals depend on. Here, Chinaberry and Ligustrum are the two main culprits, though they are not alone. With its meager resources, the Parks department does what it can to hold back the invasive species to try and give the natives a chance to fight back. 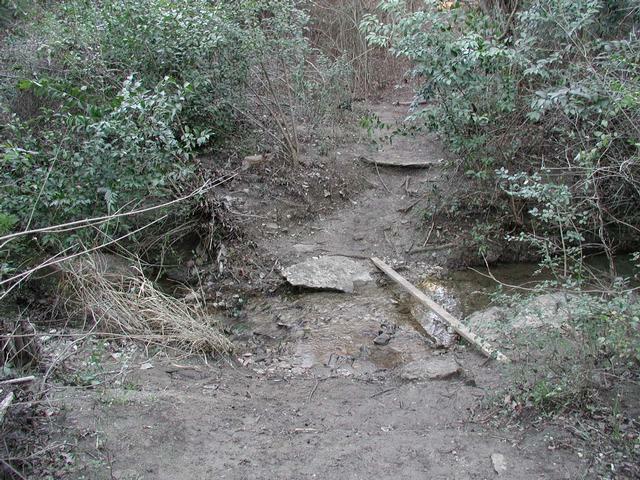 Most creek crossings were trivial. But this one presented a bit more of a challenge. As we continued our hike we stopped by the third overlook along the trail at the waypoint, "Overlook3". Here the creek canyon walls are steeper than in other areas of the preserve and this overlook provides a vantage point from which to observe from above the vegetation that runs along the creek's banks. Some sections of the trail can be a bit steep. The southern half of the preserve is less hilly than the northern portion. 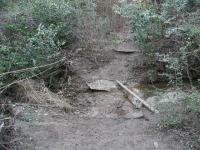 Mostly, the trail parallels the creek and crosses it at one spot marked on the map. The southern crossing is the more difficult of the two by a long shot though and this crossing may not be an option following heavy rains. The highlight of the trail in the southern section is the group of springs marked by the waypoint of the same name. There are two here in close proximity. Though the preserve boasts several others and some additional springs flow nearby outside of the preserve boundaries, these springs are the closest to the trail. 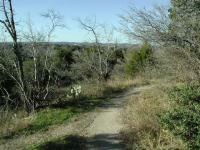 The length of the hike at the preserve is a short 1.5 miles. However, what the preserve lacks in mileage it more than makes up for in roughness and beauty. 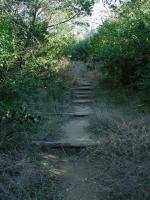 One should not expect to avoid other hikers on the trail, but the number of people encountered here is far less than one would see at the Blunn Creek Greenbelt hike just a couple of blocks away. 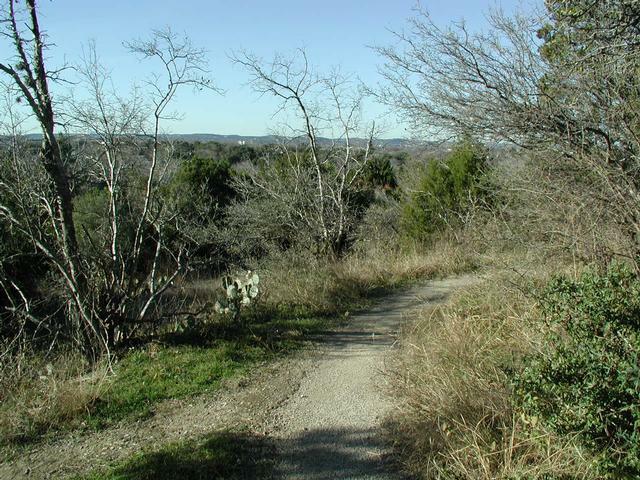 So if you find yourself in South Austin with a need for a quick, escape from the hustle of city life reserve some time to try out this preserve. Great neighborhood trail for jogging. Hiked this with my 2-year-old, and it was perfect for his skill level with a couple of fun challenges. When the bluebonnets are in full bloom this place has spots that are downright magical. The cliff drop-off down the the creek bed is very impressive, especially when you contrast it to the impressive view of St. Edward's University and of the City. 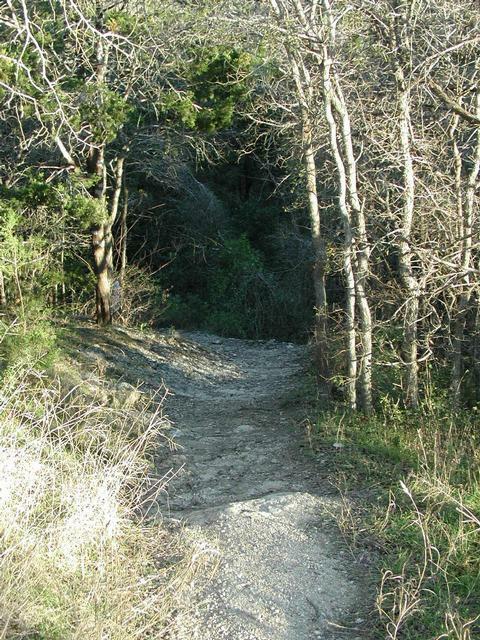 The recent work done on the trail is impressive with an emphasis upon native plant survival. This hike will only improve with time. Great hike this morning at Blunn Creek Preserve. Lots of bluebonnets in bloom. Neat that it is an ancient, extinct volcano. Not many know about this area's volcanic past. Spring has definitely sprung so watch out for poison ivy right at edges of many of the trails. Could use a good trash pickup, but not too bad overall. A lot there for the location. could easily wander for quite a while. Sign says no dogs but there were many dogs there anyway. Canyons, rivers and volcanos in the middle of town. Nice little hike with several amazing views and interesting history lesson about the geology of the region. There was considerable trash just about everywhere especially along the creek. Basically a dump. There was no one around and I understand why. Like the others have said, it is surprisingly quiet. Awesome view with the "volcanic overlook." 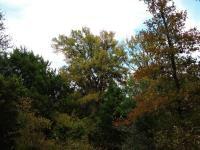 Lots of squirrels and possibilities of seeing wildlife.